Because of the massive and ongoing drone of news regarding drought, vineyards have been front and center when it comes to what is happening in the wine business. 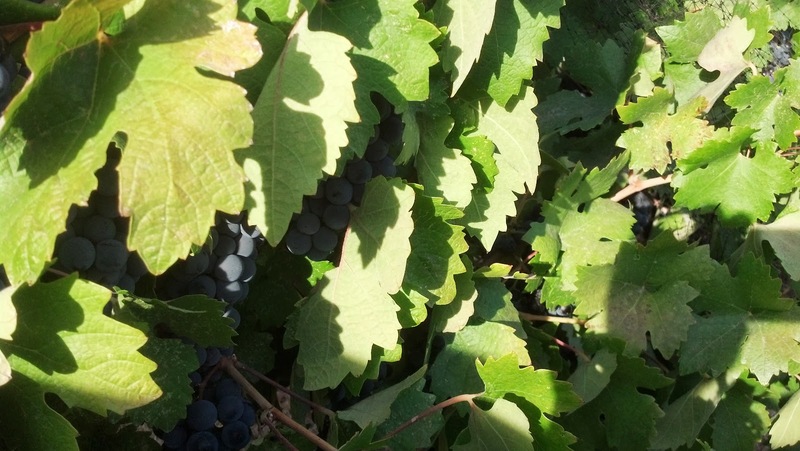 The latest concern is that veraison is occurring earlier than normal in 2014. Yeah, what the heck is veraison? There’s some real purple grapes appearing through the canopy – Veraison has definitely occurred with these Zin grapes. Veraison is a term that most would or will never need to know, yet is a critical stage during the ripening process for grapes in which they turn color. People in the wine industry know all about the term. What it means is that usually the grape turns from green to red and finally purple, while also becoming softer. In other words, the berries stop growing and start ripening – and the process doesn’t take very long. And now you know an important term in the wine business. By the way, it’s pronounced ver-ray-shon. After typical growing season in spring and relatively quiet first part of summer, when veraison happens, vineyards start getting busy. Vintners and staff prepare for and bottle usually two years ago’s vintage and then ready for harvest when it hits in earnest. Here in Paso Robles, an early harvest is beginning to become a reality as some picking has already occurred. And in this particular instance, a much earlier than normal harvest might not be such a bad thing what with the likelihood of an El Nino heading our way. Rain can cause problems with grapes so although the veraison means moving up workloads that may not have been prepared for, dodging moisture which can cause mildew is much worse than a little inconvenience. So veraison is definitely underway and here’s an instance that might show how early the change is this year. A small local multiple gold-winning vineyard here in Paso usually sees veraison of their Zinfandel in mid-August – or even a bit later – but last year saw ripening happen near the beginning of August. This year veraison has already started with a week of July still to go. Of course with an early veraison, means the sweeter grape are here sooner, which brings in pest like birds. That in-turn means the netting needs to go on. Also, with veraison happening earlier, the grapes are exposed to more heat while ripening. 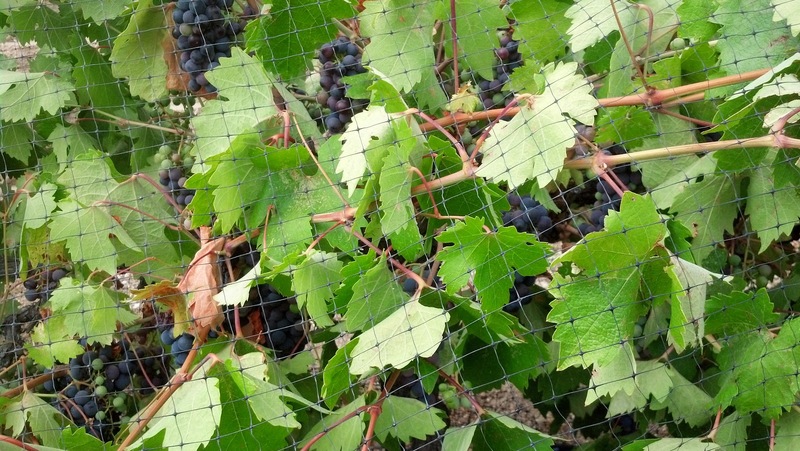 Pinot Noir is usually the first grape to go through veraison and Cabernet Sauvignon the last. This critical period when grapes lose their acidity and gain sugar – the beginning of wine development – is an exciting time in wine country and means harvest isn’t far behind. And note that this wasn’t a big surprise considering the early bloom that most received this year due in part to the drought. However, things could have been much worse if it wasn’t for some needed rain in March. This matters to us because we’re sort of tied at the hip with the wine industry. With bottling happening a little sooner, it’s time us barrel folks start gobbling up the used barrels. This entry was posted in Wine and tagged grape ripening, veraison, vineyard, winery on July 29, 2014 by PasoDr. Yes, I do know how to spell. 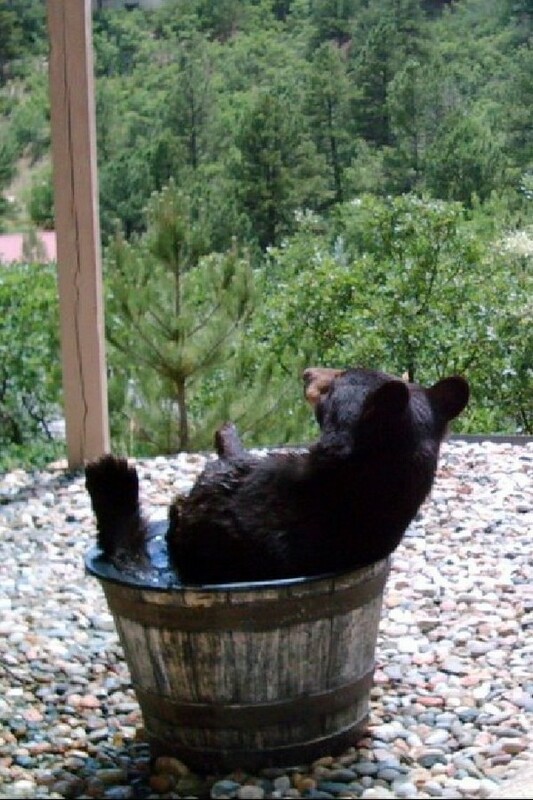 Bear with me – pun fun intended. You purchase a half barrel and maybe place a liner inside to catch rain water. That’s one way to do it although anytime you leave an open container out, especially as big as a half barrel, varmints like mosquitoes tend to breed. Then there are bigger intruders – like bears. Maybe you saw this story a few years back when it came out in Colorado. The homeowner had half barrels with liners to fetch rain water for his garden. Problem was something was emptying his barrels. That something was a bear – maybe a black bear … and it was caught on camera. 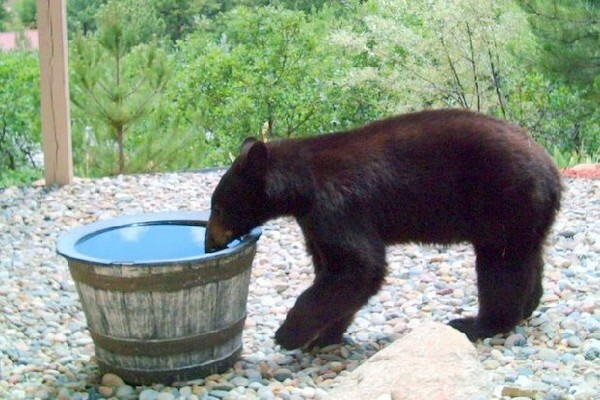 The owner was mystified and set up cameras to catch the perpetrator, which happened to be the aforementioned bear, who would cool its tush off by sitting in the barrel … a bear in a barrel, so-to-speak. We’ve talked about rain barrels in the past and you can go here for some valuable information but this story brings up the issues of pest. Whenever dealing with something outside and exposed to the elements, some care and caution should be taken. Mosquitoes are a real problem with water and if you don’t have an enclosed system, you might have to add a horticultural spray oil as one idea. Also, kerosene or mineral oil can work as well. Chlorine does a good job as well but then again, you have to be careful since you’re going to use this same water for your garden. For bears, there’s really no deterrent for a huge animal like a bear except to have a full barrel and preferably an enclosed system – simple as that. This entry was posted in Barrels +, Water and tagged bear in a barrel, half barrel, rain barrel, rain barrel mosquitoes, Rain Bearrel on July 28, 2014 by PasoDr. This would have made it on the ’90s TV hit comedy Home Improvement. Except Tim ‘The Toolman’ Taylor (played by Tim Allen) would have tried to up the power and speed of his Binford 5000. I saw this item last Christmas but had lost track of and forgot all about this trick tool. I realize not everyone is into gadgetry and certainly there are those in the wine culture who turn their collective noses up at such silliness. 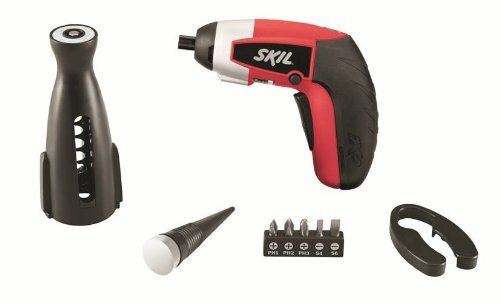 Regardless of what one might think of this contrivance, one of the king’s of tool making – Skil – offers up the Compact 4-Volt Max Cordless Lithium-Ion Driver Combo Kit with Wine Opener. Grunt, grunt, grunt. Actually, there’s little grunting involved with this neat and cool device. The screwdriver is small and lightweight tool with a corkscrew attachment that’s slick and seemingly effective. It comes with a rechargeable, lithium-ion battery and is a perfect addition to any respectable tool person’s equipment crib – as long as they have a hunkering for wine. 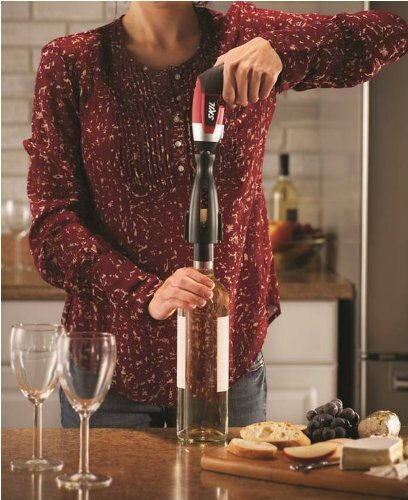 The low speed, high torque ability offers you control over the corkscrew with ease. It has an LED light so you can drink in the dark without a problem – very important. Any way you look at it, at the very least, you have a high quality cordless screwdriver. Will combining power tools with wine drinking work? Your imagination can take you to a very fun and interesting situation should the libations be flowing a little more than normal with the mix of a power tool, could, well, yes, let’s just say interesting is one way of putting it. In any case, this combination is available at Amazon for under $50 out the door and except for the occasional lawsuit or two that might come from combining drinking and machinery, this is a fun and handy tool to impress your friends and family – at least those who have a tool-centric mind … or a sense of humor. May I open that bottle of wine for you madam? Grunt, grunt, grunt. This entry was posted in Wine and tagged Compact 4-Volt Max Cordless Lithium-Ion Driver Combo Kit with Wine Opener, Cordless Lithium-Ion Screwdriver with Corkscrew Attachment, Cordless Screwdriver With Corkscrew, electric corkscrew on July 24, 2014 by PasoDr. A few followers and friends have contacted me in the past, asking about wine barrels for weddings. Consequently I thought I’d show some pictures, so folks can get an idea of just what a wine barrel wedding would look like. I’m not a wedding expert by any stretch of the imagination, but I did play one on television – okay, that was a joke. 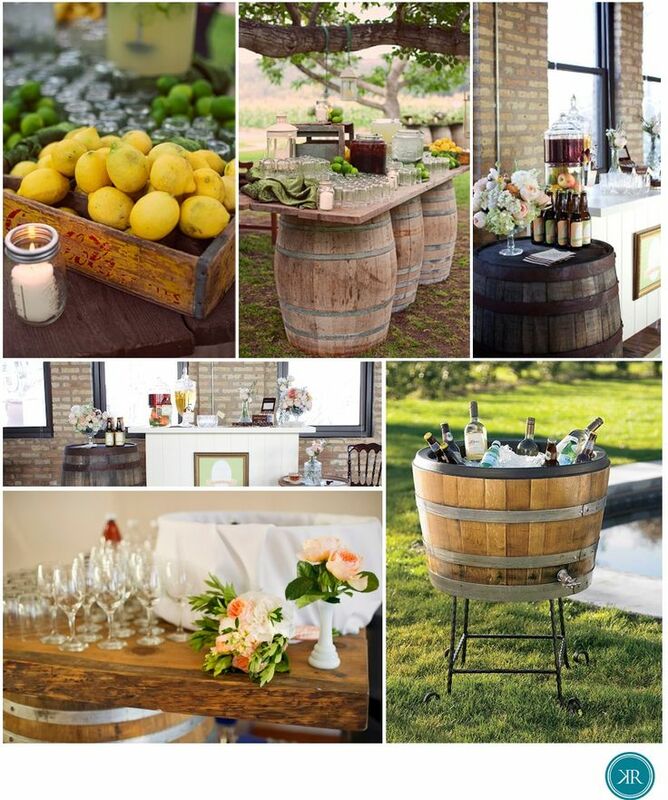 However, I have collected many pictures over the last few years for wine barrel ideas and these images represent the best that I could find regarding weddings. Getting married in a winery isn’t new but it is a growing phenomenon with settings and surroundings that are hard to beat. I mean really, when doesn’t scenery with rolling hills of vineyards not conjure up a greater illustration of the wedding spectacle. 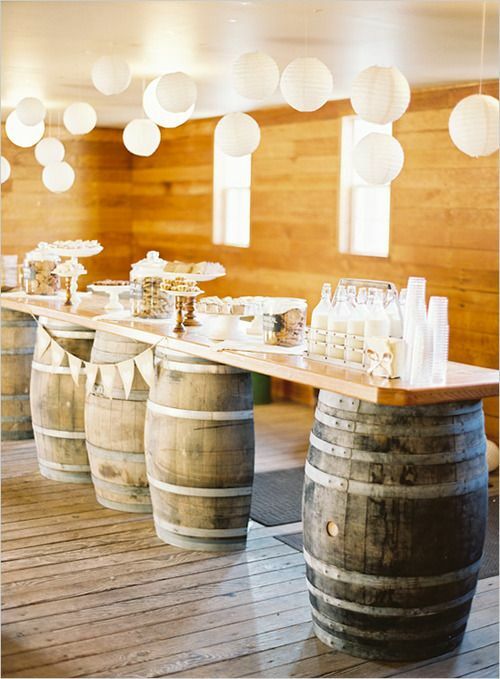 What better way to set off that idyllic look than wine barrels. If they are Decorative or the more eclectic rustic used barrels, the appearance of wine barrels adds a stunning charm, character and well, they’re just plain cool to view. Whether at or in a vineyard, wine barrel weddings have a certain flair and maybe even add some elegance to the celebration. And don’t let the idea of not being at a winery slow you down. Even if you’re not using a winery and it’s vineyard for the wedding, you can bring the vineyard to you, so-to-speak. You can order used barrels to have on the special day or if the investment is a bit too high and you’re so lucky as to be within a couple hours of Paso Robles, you can rent the barrels. Most local wedding rental companies should have wine barrels available. 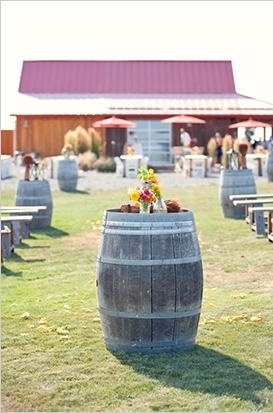 Regardless, having wine barrels as decor in your wedding ceremony is a unique rustic yet exceptional way to enjoy the special day. This entry was posted in Barrels +, Events and tagged oak wine barrel, old used oak wine barrel, wine barrel weddings, winery wedding on July 22, 2014 by PasoDr. The cows are coming home? The plucky little celebration of fun is held at the Paso Robles Event Center, which is used year-round for all kinds of shows, concerts, business events and many other gatherings. However, the Mid State Fair is by far the largest gathering the Event Center will entertain. Not exactly the largest fair size-wise, this extravaganza in Paso Robles packs quite a wallop and is probably pound-for-pound the best festival you will ever enjoy. In fact, attendance at this fair ranks it in the Top 50 for North America. The fair starts on a Wednesday with the morning Cattle Drive (when not mysteriously cancelled) where several dozen heads of cattle are taken down Union and 13th to Riverside and then inside the fairgrounds. That’s when this small but smoking hot fair gets going. There’s the typical carnival rides and animal exhibits including equestrian shows, but the biggest deal this event has is entertainment. 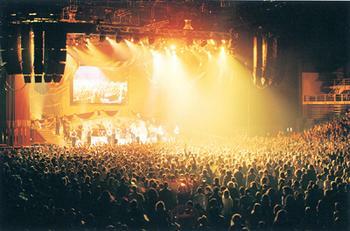 Huge marques and performances happen all over the fair during the 12 days including the largest names that the entertainment world can muster performing at the Chumash Arena each evening. There’s also every type of food imaginable and along with talent shows, the place is buzzing with action. Of course, there’s wine tasting and wine contests plus enough drink concessions to wet anyone’s particular whistle. Parking is somewhat at a premium unless you come early but the city has a free shuttle service available during the fair. Click here for more. If you haven’t ever seen mutton-busting, you have to check it out. Nothing like seeing a small child terrified as they hold on for dear life on top of a romping sheep. It goes on all afternoon each day as parent after parent signs their child’s life away to entertain the folks. My nephew did it a few years ago and although he didn’t win, it was hilarious to watch. The town of Paso Robles is about 30,000 but balloons to more than twice that every summer as they entertain people from all over the world. The otherwise quaint city sits roughly halfway between Greater L.A. and the Bay Area, just 20 miles from the Pacific Ocean. Be prepared for delays in traffic and also the blazing heat that can rise over 100 degrees – though usually the mornings and evenings are much cooler. 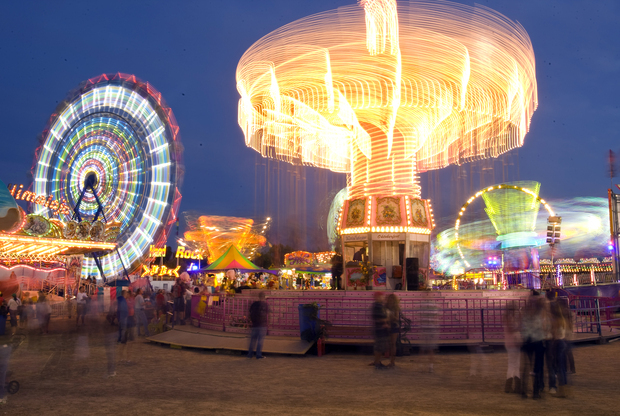 With all kinds of displays, exhibits, entertainment and rides, there’s something for everyone. The fair opens at 9:00 am and closes at Midnight all 12 days. 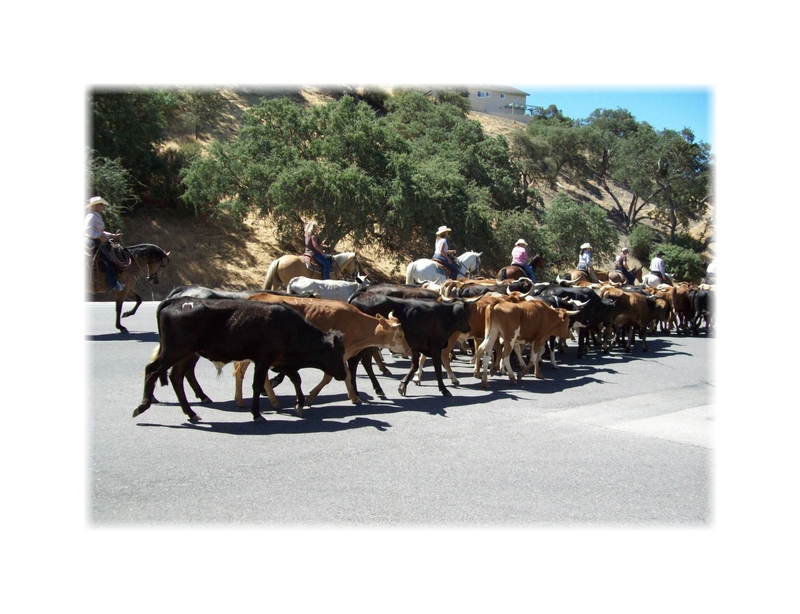 This entry was posted in Central Coast, Events and tagged California Mid State Fair, cows are coming home, entertainment, Paso Robles, Paso Robles Event Center, The Biggest Little Fair on July 16, 2014 by PasoDr. If you’ve considered a half wine barrel as a planter for flowers, you may be concerned with the weight and therefore difficulty of moving you’re oak planter. Let go of your concerns because we have an almost magical half barrel idea for you. Take note that using this idea will likely make your planter last forever given certain care is taken or you use a Decorative Planter Barrel. This is simple but a great idea nonetheless. 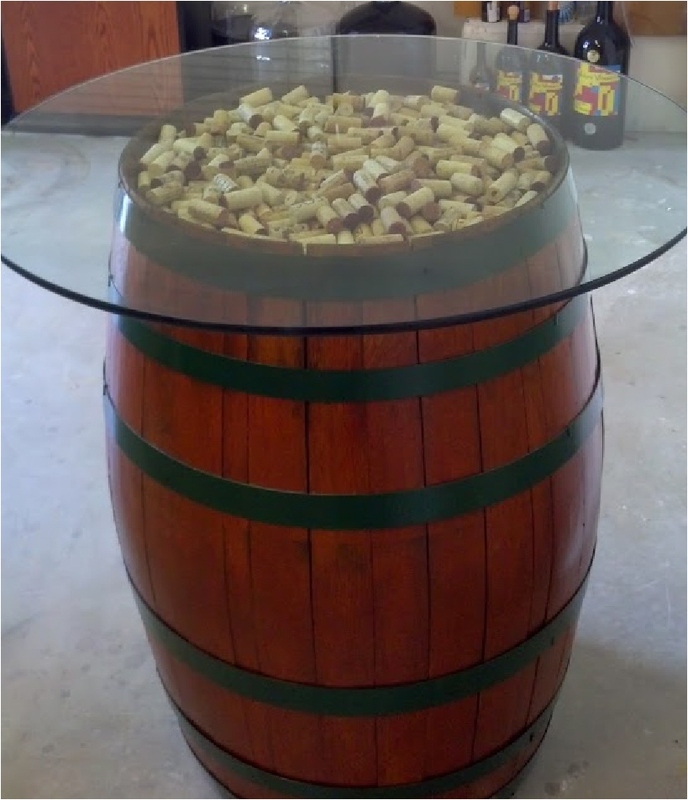 First, you need a genuine oak wine planter barrel, either new or used. Next, purchase wood chips to fill about half the barrel. Acquire multiple flowers at your nursery or garden center and you can either place the flowers in another planter or leave them in their original existing plastic containers. You can use the chips or add more to fill around the potted flower containers so as to keep them secure. Water them as you would normally. That’s it. Now, you have a barrel that you can move around and add, subtract or change flowers without having to dig them out. It’s almost magical when you’re able to make changes and nobody knows how easy it was for you. It should be also noted that since you won’t be watering this barrel’s soil, the construction of a used barrel will dry up and become somewhat wobbly as the staves condense and pull apart. 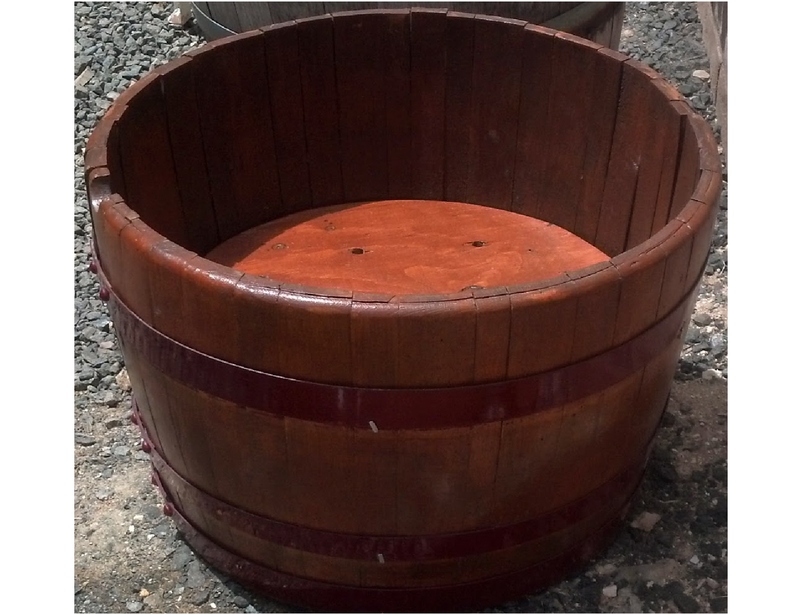 There’a an answer to that though with – as we mentioned above – the Paso Wine Barrels Decorative Half Planter Barrel. Because it has tightened bands, stain, sealer and varnish, they don’t tend to dry out as quickly as standard used barrels do. Also, they are reinforced with an interior band allowing them to sustain many years not being moist. If you decide on the used barrel, you might want to spray it with a garden hose occasionally or each time you water – keeping the wood from drying out will allow the barrel to stay tighter. Now it’s time to have what your friends, neighbors or cohorts didn’t figure out – an almost magical everchanging and portable flowering wine barrel. This entry was posted in Barrels +, Gardening and tagged Everchanging And Portable Flowering Wine Barrel, half barrel, planter barrel, portable barrel, Portable potted planter, potted plant on July 15, 2014 by PasoDr. Believe it or not, this oh so positive refrain comes from the ‘Beer Barrel Polka’ (Roll out the barrel) and I couldn’t agree more. What’s more positive and fun than a garden at your footstep. 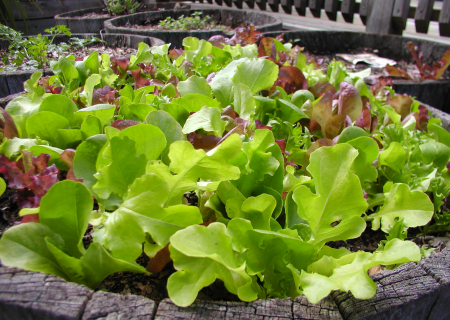 Lettuce is one of the fastest growing plants in a garden. In fact, their cousin the spinach, grows a bit faster. Here’s what you do to have pest free lettuce and spinach in three to seven weeks. Why the wide spread? Read on. First, purchase a wine oak half barrel from a reputable source – like Paso Wine Barrels. I mention reputable, because so many garden centers, especially the notorious big boxes, offer barrels that for one, aren’t wine barrels and sometimes aren’t even oak … plus they want to fall apart. Not to toot the horn, but places like Paso Wine Barrels offer fresher and usually better looking half barrels along with decorative types that are reinforced and sealed, making them last almost forever. Still, regardless where you purchase the barrel, unless it’s sealed, you might want to go ahead to add a sealer – both inside and out. You don’t have to do this but we recommend it for a longer lasting barrel. Pssst … I know where you can get authentic genuine quality wine barrels. Next, drill a half a dozen or so holes in the bottom of the barrel for drainage – this is a must. Find a small hole saw or large drill bit to make the holes. Make sure to place a sheet of weed barrier cover over the bottom of the holes. Place about two to three inches of small rocks on top of the barrier underlayment as this will offer proper drainage. The underlayment will help keep dirt and soil from draining out the bottom of the barrel holes. Now add a mix of dirt, garden soil and compost if you have it. This gives the necessary nutrients for the garden lettuce and spinach. We use only organic seeds but regardless, purchase seeds from your local nursery or garden center and plant them a couple inches apart. The seeds should be covered in no more than a half an inch of soil. Water as recommended but don’t be too concerned with over watering because for starters, you have drainage and two, plants like these need regular watering. Mulch around the plant if needed to keep in the moisture, but check with a local Master Gardener and/or the American Horticultural Society for more information. In any case, seedlings should sprout within a handful of days and you should have a bunch of little plants within the first couple weeks and about seven weeks later, you will be eating fresh leafy garden salads. Set your planter with lettuce and spinach near your back or front door, but make sure it has shade. These leafy vegetables usually don’t do well in sunny hot climes and tend to bolt when extreme heat hits them. Again, please be cautious what kind of barrel you use. I’ve seen some dilapidated barrel at certain garden centers which will remain anonymous that have poor excuses for barrels. They may have an eclectic look but won’t last long and may not even make it home without falling apart. This entry was posted in Barrels +, Gardening and tagged barrel gardening, Fresh Lettuce Right Outside Your Door, half barrel, lettuce and spinach, lettuce in a barrel, oak wine barrel on July 15, 2014 by PasoDr.